Switzerland is running out of SNOW, warns a new scientific study. The country is renown for its world class ski resorts – such as St Moritz, Zermatt and Klosters – snow-covered playgrounds for the rich, the famous and the Royal Family. But state of the art satellite data suggests the popular ski destination, featuring the spectacular Swiss Alps, is melting – and has lost almost 20 per cent of its snow. Resorts may get a frosty reception from avid skiers in search of the perfect ‘champagne powder’ after it was confirmed more than 5,000 square kilometres of the white stuff has disappeared from the country over the past 12 years. Between 1995 and 2005, 36 per cent of Switzerland experienced little or no snow with a zero to 20 per cent chance of snowfall which spread to 44 per cent by last year. 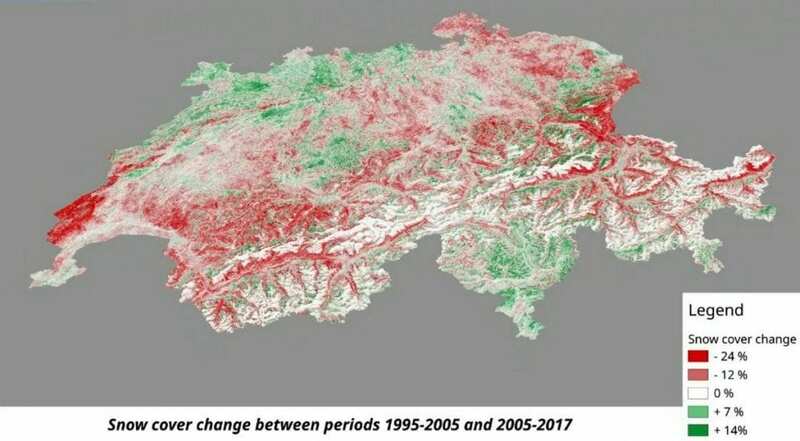 Scientists think global warming could be responsible for this irrefutable observation which comes from 22 years of satellite data covering the entire Swiss territory. 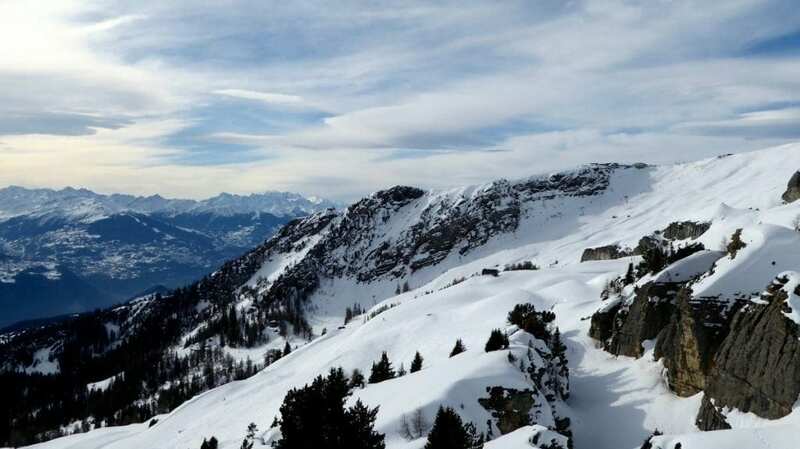 Scientists extracted data from the Swiss Data Cube, a new tool which revealed that snow is gradually disappearing from the Swiss plateau and becoming scarcer at higher quotes. The ‘eternal snow’ zone, where the probability of snowfall varies between 80 to 100 per cent, still covered more than a quarter of Switzerland between 1995 to 2005. But ten years later it had dropped by 15 per cent to 23 per cent, a loss of more than 2,000 sq kms – equivalent to seven times the size of the canton of Geneva. The results come after UNIGE researchers gathered images taken by the last three American satellites of the Landsat Earth observation program and the European Sentinel-2 satellite, since their respective launches in the early 1970s. Dr Giuliani said: “Detailed knowledge of snow cover and its evolution in Switzerland is an essential tool for public policies decision-making. “Beyond the economic issues related to tourism, other questions arise such as flood risk management or water supply, given the storage role that snow plays, retaining water in winter to release it in spring and summer. The snowcover.ch project will use data from the European satellite Sentinel-1, a radar satellite that will also measure the amount of melting snow, allowing for a more comprehensive view of the snow cover evolution over time. Scientists can monitor snowfall by superimposing satellite images of the same place and precisely follow its evolution over time thanks to earth observation satellites that regularly pass above the same location. The Geneva region is overflown every 15 days by Landsat satellites, and every five days by Sentinel-2. By ‘stacking’ the pictures, it is possible to add a temporal dimension to the two spatial dimensions offered by each shot taken from space, and the Swiss Data Cube derived from this three-dimensional architecture. Dr Giuliani said: “We have stored the equivalent of 6,500 images covering 34 years, a feat that only an open data policy has made possible. “If we had to acquire these images at market value, more than six million Swiss francs would have been invested. “Knowing that each pixel of each image corresponds to the observation of a square of ten by ten metres, we have 110 billion observations today. In addition to snow, the Swiss Data Cube offers the possibility of studying many other topics such as vegetation, evolution and rotation of agricultural areas, urbanisation and even water quality as satellite images can be used to monitor the essential indicators for this in lakes and rivers. The project was launched two years ago on behalf of the Federal Office for the Environment, which wanted to evaluate the technological solution developed by Australia. Convinced by the first tests, the federal authorities decided the following year to equip themselves with a complete cube which today delivers its first results. The data are freely accessible to scientists and the general public worldwide.